Where's one place you have absolutely no (or very minimal) desire to visit? Why? For this link-up I want to share a traveling experience that was bittersweet. It was a place I definitely did want to see but, a place I wish I didn't exist. A history so sad, but so important to acknowledge. I was able to visit the Dachau concentration camp twice when we lived in Germany. The entrance: "Works make (one) free"
The moment we drove up to the grounds, we were overtaken by the "realness" of it all. You see it in movies and books, but until you see those walls and guard towers, you have no idea how real it all feels. The inside of the main building has been turned into a museum. Okay, you get it. I won't haunt you with more. 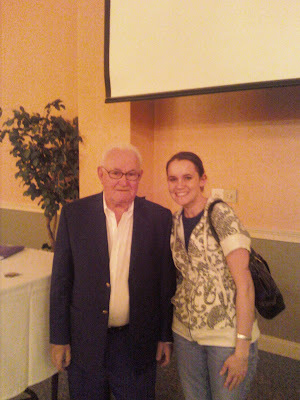 A couple years ago, my friend Becky and I were honored to listen to this man speak. His name was Chaim Melamed and he was a Holocaust survivor. I write this in tears as I just find out that he passed away at 85 in February of 2011 in Savannah, Georgia. I feel incredibly lucky to have heard him speak and although his stories broke my heart, I remember he had a very specific message he wanted us all to hear. He didn't want anyone to forget what he and millions other had endured. "Mr. Melamed felt that his mission was to educate everyone about the danger of hatred and racism. He spoke to many schools, colleges, churches and army bases to ensure that present and future generations never forget the horrors of the holocaust. He felt that it is the present generation’s responsibility to insure that history would not be repeated." So, I apologize for being so melancholy today, but it is a small price to pay to keep this memory alive. Holocaust Remembrance Day is April 19th. More information on Dachau can be found here. That was a very moving and memorable evening. I am honored to have heard him speak. Thank you for sharing, Jessica! This was a beautiful post, albeit in a very tragic way. I felt the same way when I went to Rwanda last summer. It was sad and very difficult at times, especially when touring the memorials, but somehow those sad moments still ended up being my favorite parts of the trip, and I think it was purely for the humility of it. Visiting places with such a tragic history offers a unique experience and definitely causes you to appreciate your life situation more, wouldn't you agree? Thanks again for sharing. Absolutely. Thank you for the prompt that inspired me to write it. I have big dreams of seeing Germany and some surrounding areas but I am nervous about seeing the camps. I don't know if I'll be able to handle it, but I feel like I owe it to those people to go any ways and to try for their sake. The camp it is a sad reminder of what happened, I'm glad people are able to visit these places and learn about what happened there so it never happens again. What an amazing experience it must have been to hear Mr. Melamed speak. Thanks for sharing this touching post. Thanks for sharing this. I've always wanted to go to Auschwitz or Dachau - I can't imagine how much energy is there. So good that places like this still stand so humanity can remember how we went f***ing bananas that one time...hopefully will keep us from repeating it. I heard a Holocaust survivor speak once and it was like getting punched in the stomach. Reading about it all is one thing, but hearing a real story...just so much emotion. One of my first memories as a child was visiting Dachau. It seemed eerily peaceful considering its tormented past. I enjoyed your post!